The ZEE Jaipur Literature Festival is an extraordinary free literature festival in the ‘Pink City’ of Jaipur, Rajasthan each January, described by Time Out as “officially the Woodstock, Live 8 and Ibiza of world literature”. 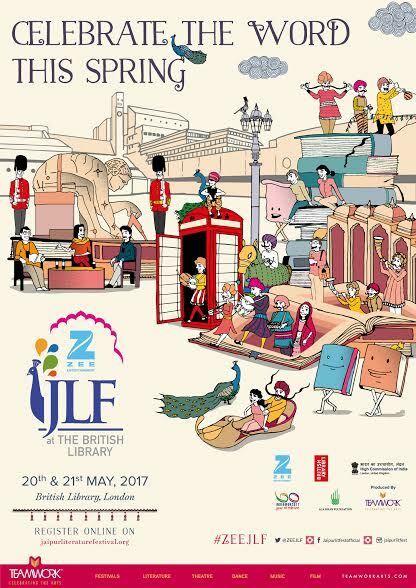 On May 20th and 21st the British Library will be transformed like never before as the ZEE Jaipur Literature Festival animates its iconic spaces for the first time in celebration of a significant cultural partnership. ZEE [email protected] British Library will present a sumptuous showcase of South Asia’s literary heritage, oral and performing arts, music, cinema and illusion, books and ideas, dialogue and debate, Bollywood and politics in the context of this broader view of India and its relationship to the UK. 2017 marks the fourth London edition of the Festival, which is rooted in the Pink City of Jaipur, India. Held every January, this year commemorated the 10th anniversary of the flagship event. Festival co-directors Namita Gokhale and William Dalrymple have programmed [email protected] British Library to provide UK audiences with a taste of what is frequently referred to as ‘the greatest literary show on Earth’ in celebration of 70 years of UK-India relations. Programme highlights include Oscar-winning British director Stephen Frears who will be in conversation with journalist and writer Shrabani Basu to discuss Basu’s book Victoria and Abdul which is soon to be released as a major motion picture directed by Frears and starring Judi Dench as Queen Victoria, You’ve Got Magic from illusionist and new-age mentalist Neel Madhav whose tricks include criminal psychology and neuro-linguistic programming. The Beatles in India: The Rishikesh Trip which will see writer, playwright & music historian Philip Norman in conversation with leading Indian journalist Ajoy Bose in a fascinating session that explores the magic and mystery of the Beatles in India nearly 50 years since their trip to Rishikesh and an evening of vibrant musical celebration with Kabir Café. Festival co-director, writer and publisher Namita Gokhale will be in conversation with panellists; Tahmima Anam, Sarvat Hasin, Amit Chaudhuri and Kunal Basu as they share their insights on the art of the novel in The Reading Room: Reshaping the Novel. Literary exiles and migrants Amit Chaudhuri, Meera Syal, Prajwal Parajuly and Lila Azam Zanganeh compare notes on whether emigration positively affects the writing of an author in Migrant Words. Panellists including Indian MP’s Swapan Dasgupta and Shashi Tharoordiscuss the enduring mystery of India’s fascination with P.G. Wodehouse one of the most popular English language writers in India and broadcaster Anita Anand and festival co-director William Dalrymple will discuss their book Kohinoor which explores the many mysteries which shroud the world’s most famous diamond alongside many more events which make up a packed programme of literary debate and social dialogue. ZEE [email protected] British Library is the first of five cultural strands which form part of the Year of UK-India of Culture in 2017, celebrating the deep cultural ties and exchange in what is a year of great significance for the world’s largest democracy as India marks 70 years as an independent democratic republic. The year-long programme also includes [email protected] in August, The Independence [email protected] Centre in October, a season of Dance & Theatre and the UK Premiere of the Bharat Symphony by Dr L. Subramaniam and the London Symphony Orchestra in November. ZEE [email protected] British Library is part of a wider partnership between Teamwork Arts and The British Library which included the presentation of a facsimile of the 1215 Magna Carta at the ZEE Jaipur Literature Festival in Jaipur this January, and will include the presentation of the Indian Constitution at the British Library during the two day event in May. To mark the UK-India Year of Culture, The British Library is also digitising 1 million pages of its South Asian Archives. Two Centuries of Indian print is a major programme to digitise the vast wealth of Indian printed books held by the Library dating from 1713 to 1914.